GIBRALTAR FRONTIER WATCH: 15min delay late morning otherwise clear today. 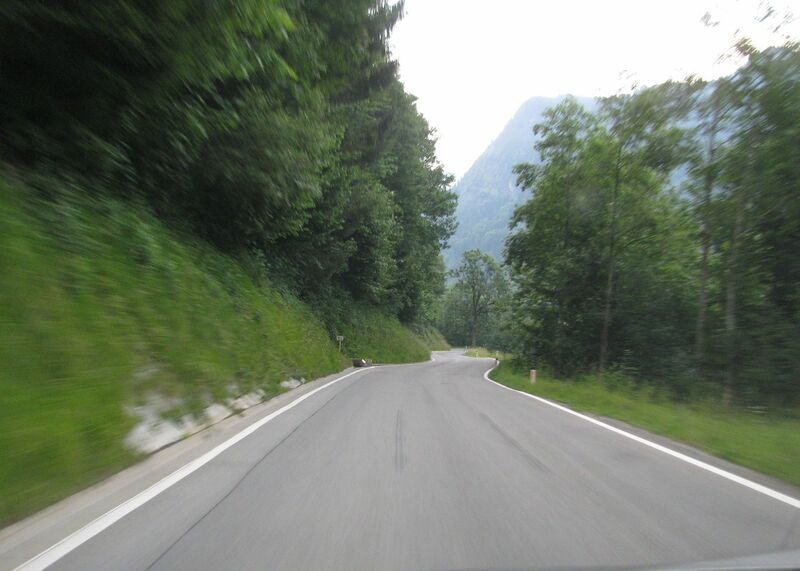 L93 Faschinajoch runs a winding 19 miles vaguely north-south between Bludenz and Damuls in the Bregenz Forest Mountains – part of the Northern Limestone Alps – in the northern part of westernmost Austria (Vorarlberg), to the east of Lake Constance (Bodensee). Where did it all go wrong? Faschinajoch. This trip was about filling in the – large – gaps in our Alpine repertoire, but also about checking out lesser known mountain roads. Hence, after a day spent mopping up the easy passes around southern Germany, we hopped on the obscure Faschinajoch as a short cut back to base in Bregenz, western Austria. 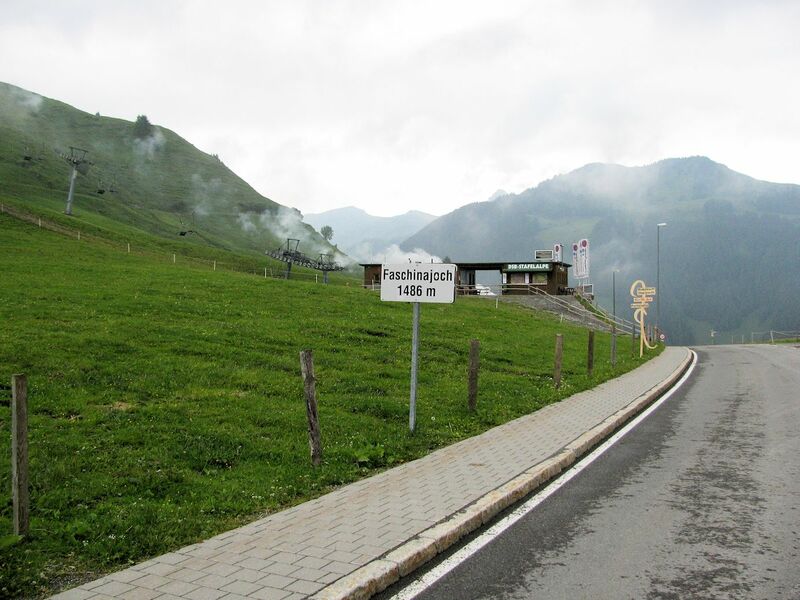 As they so often do not, the bald statistics – maximum 14% gradient, topping out at 1486m – do not tell the whole story. Comparatively, that’s medium difficulty on both counts. It doesn’t even close for the winter. But the stats reckon without the pass starting not far off sea level – as opposed to somewhere already high up in the mountains – the narrow, bumpy track and the almost complete absence of safety barriers. It went on and on and on, higher and higher and higher, the sheer drop into the valley below becoming ever more apparent as we rose above the surrounding peaks. Locals buzzing around demanding to be let through didn’t help, neither did the fading light or descending cloud. To make matters even worse, this was day one of a ten day trip completely devoted to driving mountain roads. Personally, I didn’t get a good night’s sleep after that. On the other hand, as is also so often the case, Faschinajoch was much easier on the way down. Mountain roads are all different obviously but they do split into several rough categories: vertical hairpins or gentle valley ascents on both sides, or – most often – a gentle valley ascent on one side and hairpins down the other (it’s certainly the case that to truly know a pass you have to drive it in both directions). Faschinajoch is more in the first category but it’s definitely easier from the north. If you ever want to go skiing at the Schneereich resort at the top and don’t like heights, remember that. Strictly speaking Faschinajoch connects the Bregenz Forest Valley in Damuels to the north with the Lutz River, Great Walser Valley in Faschina in the south. It skirts the highest peak in the Bregenz Forest Mountains – Glatthorn, 2133m – to the east. There is a happy ending to this story. By sheer will, determination – and not taking eyes off the road – we did manage to drive at least another seventy passes after that (final total still pending). We’ll go through them one by one in due course and update our PassFinder page accordingly. While we did avoid some classics – or at least ‘not manage to work them into the schedule’ – including Stelvio, Forcola di Livigno, Gavia and Umbrail, and the big four east of the A10 in Austria, we did steel ourselves to tackle some major passes, among them ‘The Loop’ from Andermatt in Switzerland (Gotthard, Nufenen, Grimsel, Sustenen and Furka), Silvretta and Grossglockner in Austria and Sella, Falzarego and Fedaia in the Dolomites. Rather than a tale of derring, death-defying doo in the Alps we’re better placed to write The Neurotic’s Guide to Mountain Driving though, despite a few dodgy moments here and there, we managed to conquer our fears – one of us better than the other – and, ultimately, both had a great time doing so (especially in retrospect). Our target of 150 Passes in Ten Days was missed as much because we ran out of time as courage though we do now have a better grip on the logistics (more on this soon). Having pretty much covered Austria, eastern and central Switzerland and northern Italy, the mainly remaining Alps passes are those in France. They are the really big ones: Col de l’Iseran (12%, 2770m), Galibier (12%, 2645m) and La Bonette/Restefond (12%, 2678m). But we’ll have to wait until next year to drive those, or maybe the one after. 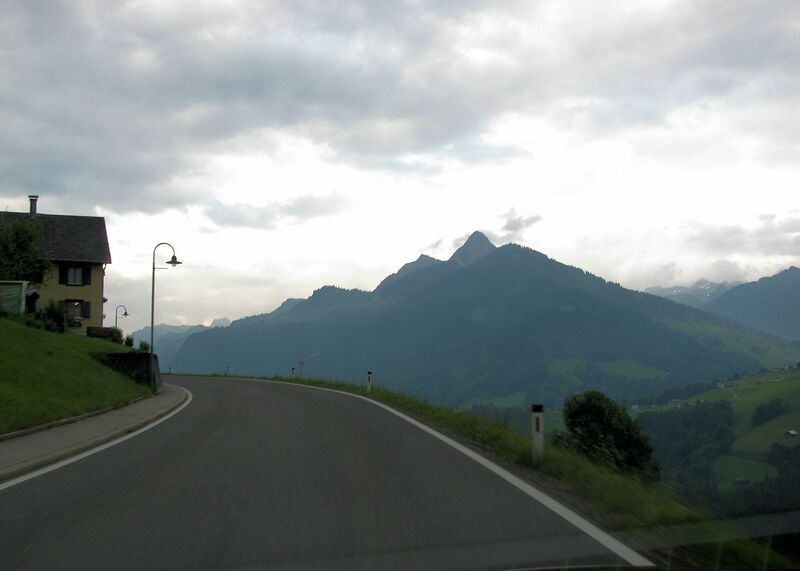 We headed six miles east on the rest of L93, the Damuels-Au road (14%, 1428m), to the B200 back to Dornbirn/Bregenz. Due west from Damuls however is L51, Austria’s own Furkajoch (14%, 1761m) running 20 miles to the A14 north of Feldkirch. East from Au on the B200 is Hochtannberg (14%, 1675m) then south on B198 through Lech is Flex Pass (10%, 1784m).